Home/Uncategorized/Exhibiting to the President of China! So we’ve had an exciting week here at Graphene Lighting. 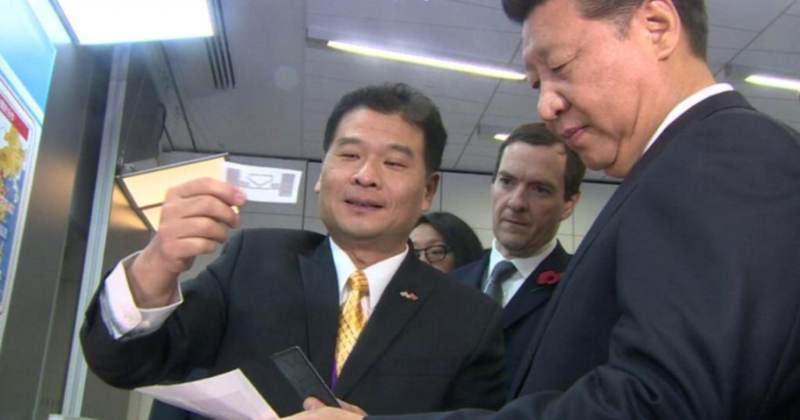 The University of Manchester’s National Graphene Institute was treated to a visit by the Chinese premier, president Xi Jinping. We were lucky to be granted 1 of 4 exhibition stands that the Chinese leader browsed after a speech by Dame Nancy Rothwell, vice-president of the university. Crowd gathered outside the National Graphene Institute for the visit by President Xi. Security was tight and all the exhibitors had to spend over an hour, out of sight, while the president visited the rest of the institute. But we did have a chance to take some pictures of the assembled outside. We were delighted by the response of the president who stayed at our stand far longer than we had anticipated, and we were able to show him all of the different technologies we’ve been working on for the last 12 months. Here’s a couple of pictures from Chinese state TV with our CEO Chung-Ping Lai. Demonstrating technology to President Xi. And here’s a last one of the team, exhausted after a long week but still smiling! The Graphene Lighting team after the visit by President Xi.